This image is an infrared image, using adaptive optics at the Lick Observatory, of NGC 1260, the galaxy containing SN 2006gy. 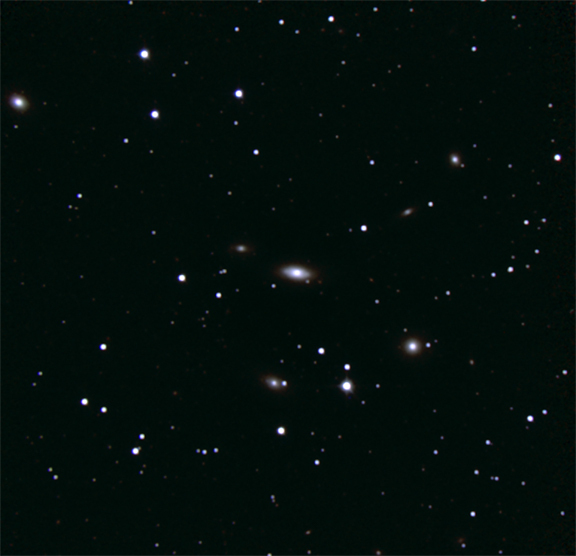 The dimmer source to the lower left is the center of NGC 1260, while the much brighter source to the upper right is SN 2006gy. This artist's illustration shows what the brightest supernova ever recorded, known as SN 2006gy, may have looked like. The fireworks-like material (white) shows the explosive death of an extremely massive star. Before it exploded, the star expelled the lobes of cool gas (red). As the material from the explosion crashes into the lobes, it heats the gas in a shock front (green, blue and yellow) and pushes it backward. 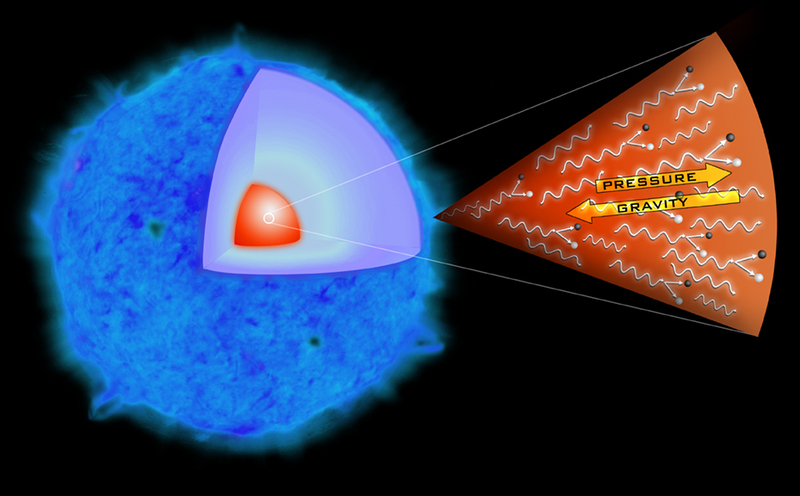 This illustration explains the process that astronomers think triggered the explosion in SN 2006gy. When a star is very massive, its core can produce so much gamma-ray light that some of the energy from the radiation is converted into particle and anti-particle pairs. The resulting drop in energy causes the star to collapse under its own huge gravity. After this violent collapse, runaway thermonuclear reactions (not shown here) ensue and the star explodes, spewing the remains into space. 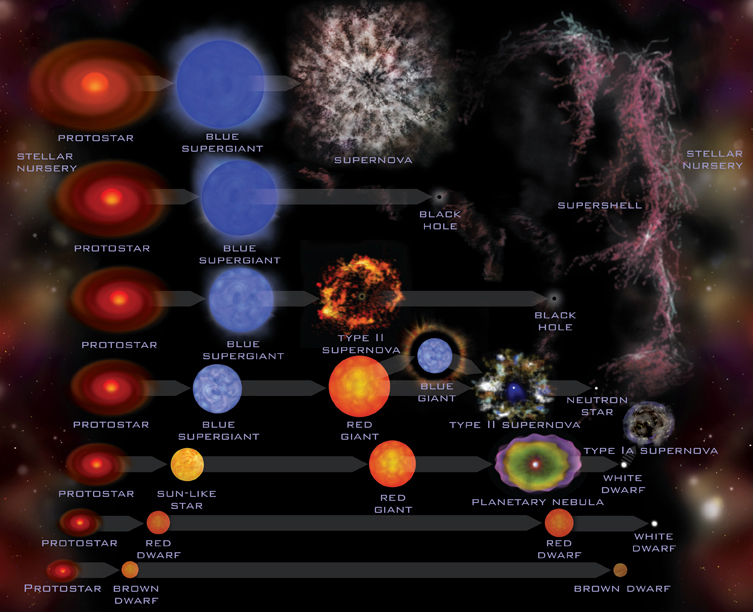 This graphic gives a summary of our best current understanding of the evolution of stars, showing their birth, middle age and eventual demise. The lowest mass stars are shown at the bottom and the highest mass stars at the top. 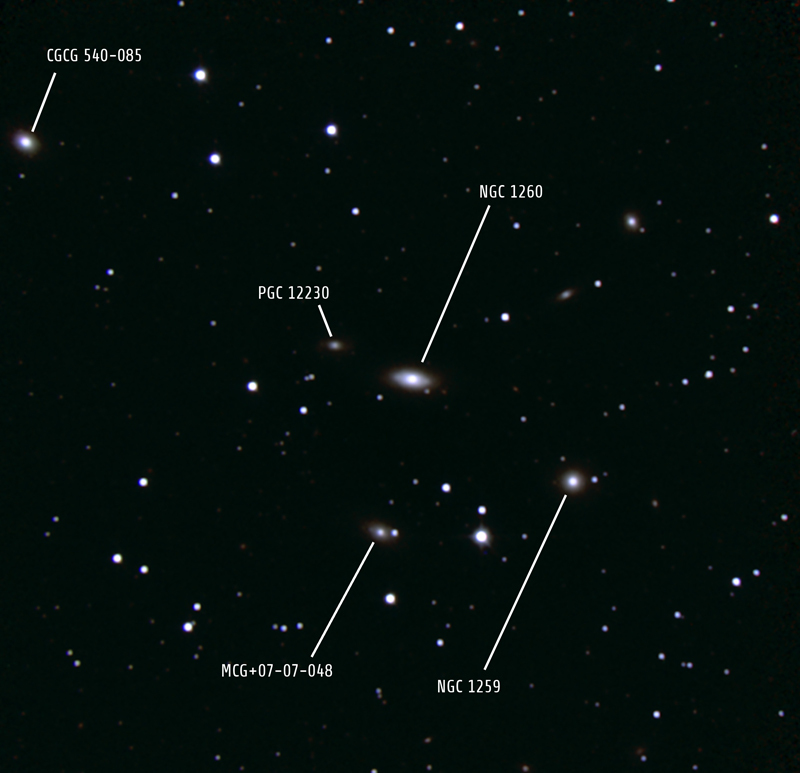 The very top line is a new addition, compelled by the detection of SN 2006gy, that describes the evolution of the most massive stars in the universe. 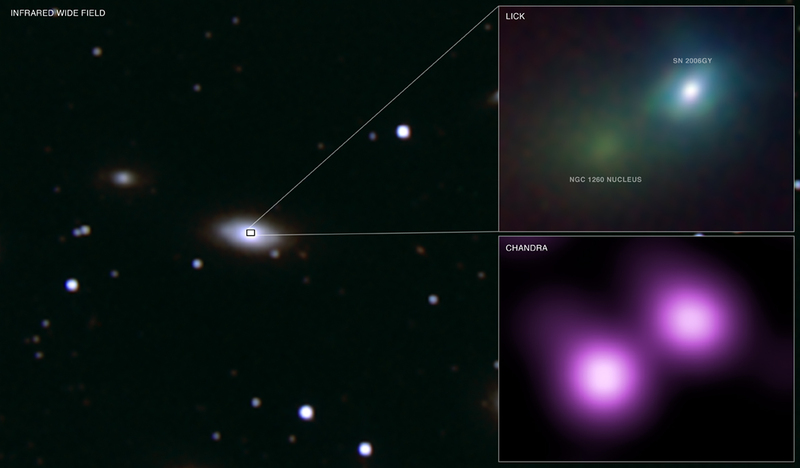 Observational evidence for the special type of explosion shown here - which is incredibly bright and obliterates the star rather than producing a black hole - was lacking until SN 2006gy was found. Estimated to be 100 times heftier than our Sun, Eta Carinae is one of the most massive stars in our galaxy. 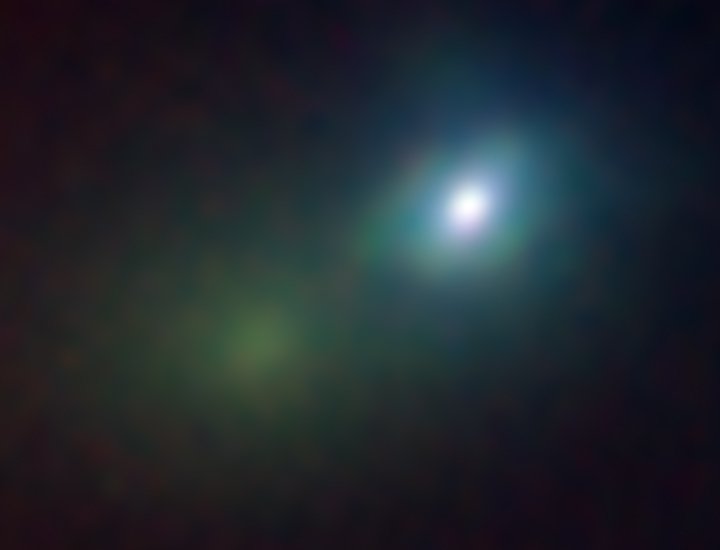 It may also turn out to be one of the shortest-lived, because results for SN 2006gy suggest that it may be destroyed by a supernova at any time. Since Eta Carinae is located in our galaxy only about 7500 light years away, this would be a spectacular event. 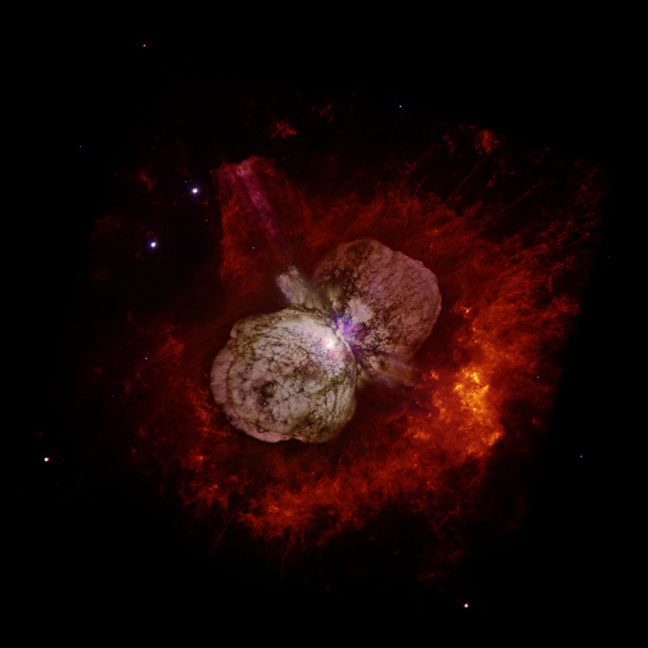 This Hubble telescope image of Eta Carinae shows a huge, billowing pair of gas and dust clouds, caused by a giant eruption about 160 years ago, when it became one of the brightest stars in the southern sky. Though the star released as much visible light as a supernova explosion, it survived the eruption. 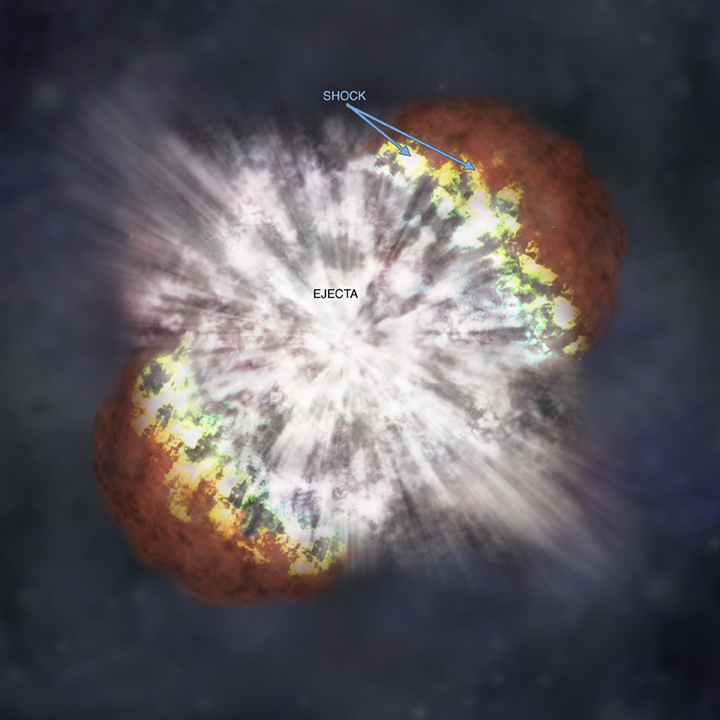 Somehow, the explosion produced two lobes and a large, thin equatorial disk, all moving outward at about 1.5 million miles per hour. A similar eruption is believed to have been generated by the star that later exploded as SN 2006gy. Supernova 1987A is the remnant of an exploded star in the Large Magellanic Cloud galaxy 160,000 light years from Earth. This composite image of Supernova 1987A shows the effects of a powerful shock wave moving away from the explosion. Bright spots of X-ray and optical emission arise where the shock collides with structures in the surrounding gas. These structures were carved out by the wind from the destroyed star. Hot-spots in the Hubble image (pink-white) now encircle Supernova 1987A like a necklace of incandescent diamonds. The Chandra data (blue-purple) reveals multimillion-degree gas at the location of the optical hot-spots. These data give valuable insight into the behavior of the doomed star in the years before it exploded. Scale: Image is 12 arcmin across. 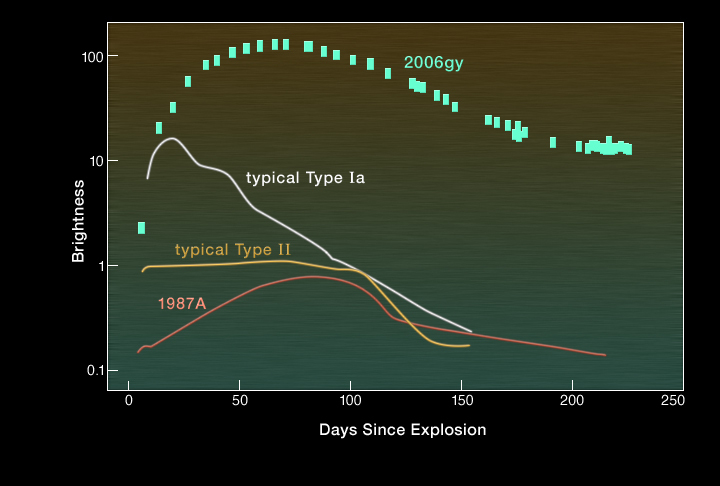 This graph shows the intrinsic brightness of SN 2006gy and how it changes over time. The graphic also demonstrates how much brighter SN 2006gy is when compared to typical examples of the two main supernova classes. Type Ia supernovas involve the thermonuclear explosion of a white dwarf and type II supernovas are the collapse of a massive star. 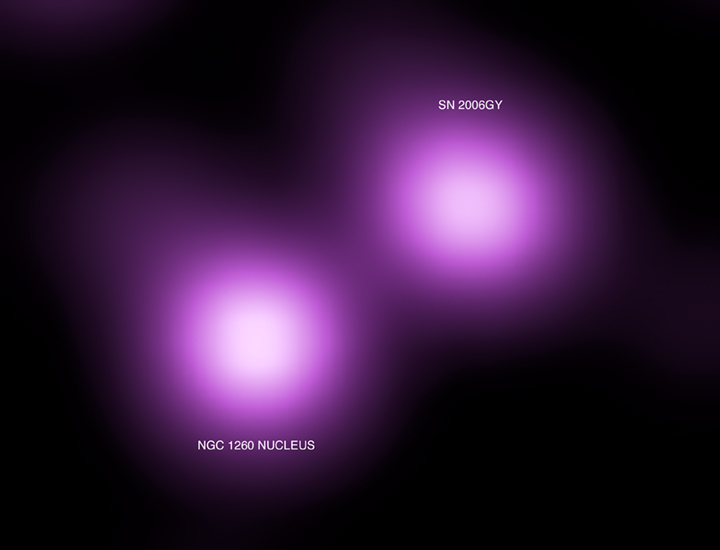 The famous supernova SN 1987A is also shown. 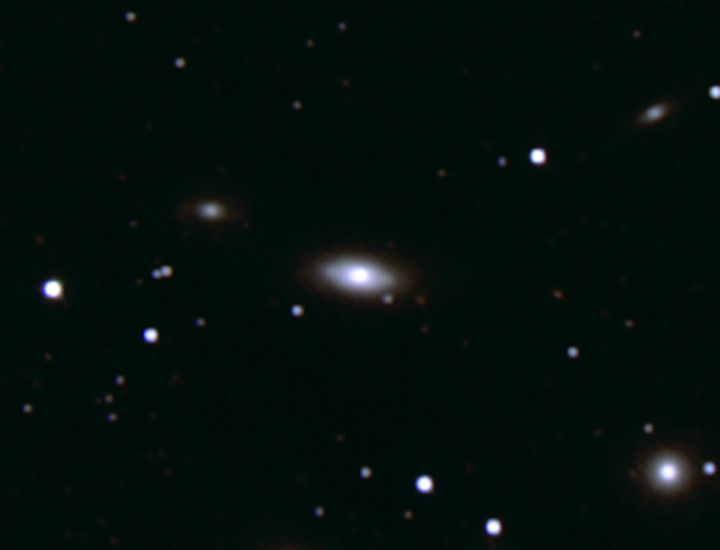 Not only does SN 2006gy get much brighter than other supernovas but it stays very bright for much longer.